With more businesses going green we take a look at five startups and companies that are working to make our world a whole lot healthier. We only have one world, and every year new green startups emerge to provide new technologies and services to help fight the problem. So many so that we made a list of new green startups that are creating solutions for the planet. Founded out of Princeton University and Northwestern University in 2003, Costa Mesa, CA, based Newlight Technologies has developed and commercialized a carbon capture technology that combines air with methane-based greenhouse gas emissions to produce a polyhydroxyalkanoate (PHA)-based thermoplastic plastic material called AirCarbon™. Described as a huge step forward for the bio-economy, the company last year signed a major partnership with IKEA for a 10 billion pounds production license. Under the agreement, IKEA will purchase half of the AirCarbon material from Newlight’s 23,000 ton per year plant in the United States. After this, IKEA has the exclusive rights in the home furnishings industry to use Newlight’s AirCarbon thermoplastics in its range of home furnishing products. The long-term goal is to develop Newlight’s production capacities to a large-scale 453 KTA or 1 billion pounds per year. Financial details of the deal have yet to be announced. The company is currently financially backed by METRIX Capital Group. More than 660 billion pounds of plastic is produced per year, with the manufacturing process itself creating three times as much carbon dioxide by weight as actual plastic. “That’s an insane amount of material,” said Newlight Technologies’ CEO Mark Herrema. The UN Food and Agriculture Organization (FAO) reports that 40% of the world’s food depends on irrigation, which accounts for almost 70% of fresh water used – making water management #1 on many farmers’ to-do lists. In Israel where water scarcity is a way of life, Tal-Ya focusses on growing more food with less water – utilizing their reusable plastic trays that can capture dew from the air. Mickey Chesla, Tal-Ya’s vice president of marketing and sales, said the trays can reduce water use by up to 90% although 50% is more typical of their results. They can also reduce fertilizer use by 30% because the trays direct the nutrient straight to the plant’s roots. The patented 28- by 22-inch recycled polypropylene trays cost $3-$5 per piece. The trays work by covering the plant’s root system, directing water and fertilizer directly to the root, while protecting the earth around the root from weeds that would compete for water, and extreme temperatures. The trays are supposed to last for 10 years. 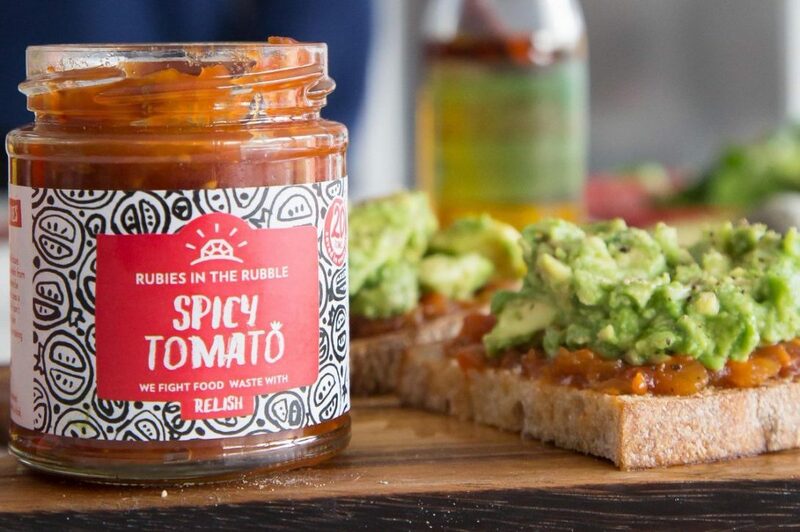 London-based Rubies In The Rubble literally and figuratively fights food waste with relish, creating ketchup, relishes and jams using the surplus fruit and vegetables from UK farms that would not be sold otherwise for being too ripe, the wrong size or ugly. “Others see rubble, we see rubies,” proclaims their Twitter account. The stats on food waste are frightening. One-third of the food the world produces is wasted through inefficiency. In the UK alone, each person on average wastes £200 worth of food a year, with food waste adding up to 7.3 billion tons per year, and 40% of British crops rejected by supermarkets. After working in the finance industry, Jenny Dawson, co-founder of Rubies in the Rubble, became obsessed with food waste and the need to address the supply chain issues that cause it. Her mother’s chutneys inspired the business. “Growing up I always had a larder full of chutney, and different ones would come out every mealtime to liven up the meal,” she said. The average adult breathes 3,000 gallons of air every day, but depending on where you live, breathing could be hazardous to your health. The BreezoMeter app tracks pollutants and determines air quality around the world. Its big-data analytics platform uses local air monitoring sensors to gather real-time pollution data, helping over 50 million people make informed decisions about when and where to go outside with accessible, hyper-local, and real-time air quality data – on their smartphone. According to the World Bank, air pollution now ranks as the deadliest form of pollution, and approximately 90% of the world lives in places that fall short of the World Health Organization’s air quality standards. The cost to the global economy? About $225 billion annually. Led by the Sustainable Ventures management team, the London-based Sustainable Accelerator aims to support the UK’s best sustainability startups and is currently raising a fund via Seedrs. Seeking an investment of £600,000, it has already raised £635,100. The Sustainable Accelerator Fund will invest between £50k – £250k into around 10 high potential sustainability businesses, providing a year-long program of expert mentorship, network introductions, fundraising support, and growth services. Companies also gain access to Sustainable Ventures’ suite of Portfolio Services during their year-in-residence and are encouraged to leverage them alongside the Accelerator program. While the Sustainable Accelerator intends to invest in all kinds of sustainability companies, it is bullish on certain verticals, namely: Circular Economy, Clean Air, Future Utility, Social Impact and Building Tech. In addition to the funding on Seedrs, governmental body London Waste and Recycling Board will be investing £300k alongside the crowd into the Sustainable Accelerator Fund. I must say that IKEA really gets the partnerships together that can help them grow, as well as the company they partner with. Good to go! The thing is, with that water tray, wouldn’t the water going anywhere on the ground get to the roots since the roots will grow to where the water is? I live in a rural area and have been learning a lot when it comes to using our land for a green movement. thank you for the tips on these companies. Pin a medal to the chest of these folks. Bravo! Farming is still going to be a very lucrative business to get into over the next many decades. The problem is finding enough land to accomplish this. I agree with you. there are still many reasons to have a farm and help provide food for families around the world with it. If you cannot find more land, then you need to find better ways to use the land that you have. You are right about that. Farming is one of the oldest professions and it still holds true today. All of that stuff in the grocery store had to come from somewhere, right? Nothing wrong with trying to make the world a better place 🙂 These startups should be at the front table for government funding just because they are green! I agree! The world could use a few companies like these that get the attention required to become successful. Unfortunately, the consumer does not care as much about green compared to cheap. So many people could really learn from companies like this. I get a nice, warm feeling when I read about things like that. Me, too. Green companies have a lot of hurdles to get around and even though they are trying to do the “right” thing, it seems that many of them are discouraged because of this. If the water trays are made from thick enough polypropylene, they should last 10 years for sure! Exactly. Even in the hot sun I think those trays are one of the best you can buy. Well worth it if you have a tree farm! I agree. Polypropylene is a great material for something like this! I wonder how the air pollution app is really fighting air pollution? It just tells me when I am breathing bad air. There are a lot of investment options for those that want to build farms around the world. Providing foods from local farms, compared to corporate ones, is a great way to build any local economy. I have been seeing a lot of things like this popping up in the state where I live. More consumers seem to be going back to the roots to get the food they want. I like startups like this because it is almost like a major boost to that movement when they go commercial. I have seen other devices that work similar to BreezoMeter. There must be a need for it in some corner of the world if I am coming across two of them in the same year. If it takes another company to find ways to use what others waste, then we must be doing something right! I am happy to see that veggies and fruits are not going to waste 100% of the time. I agree. This is a very good point. I really like the idea behind those watering trays. It makes sense and from what I have experienced, I think the fact that those last 10 years each is a solid investment!